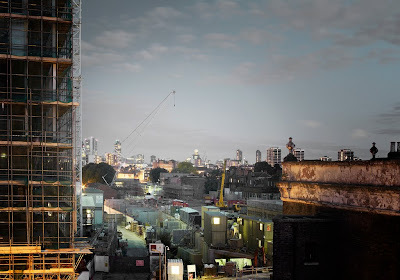 Arcola Theatre has launched its first-ever public fundraising appeal with the announcement that Antony Gormley and Katharine Hamnett have joined forces with the theatre to support its ambitious fund-raising efforts. £150,000 is required to secure the first stage of Arcola Theatre’s future development, which includes its relocation to 24 Ashwin Street - the former Colourworks factory opposite Dalston Junction station. The launch took place at 24 Ashwin Street and Artistic Director Mehmet Ergen and the Arcola team gave future audiences a first glimpse of the new space, still under development, ahead of the first public performance on 7 January 2011. To help kick-off fundraising efforts, Antony Gormley has donated an original artwork created just for Arcola that will be auctioned at a special gala event in December. Gormley’s design will also be printed onto T-shirts, which will be given to the first 200 individuals to make donations of £500 or over. Fashion designer and ethical clothing innovator Katharine Hamnett has also come on-board and revived her iconic 80s CHOOSE LIFE slogan T-shirt with a fitting new logo for the theatre – CHOOSE ARCOLA. Dalston's £63million bus stop sold for £7.50 at public auction. An auction of Dalston's £63million bus stop, which has been built on The Slab over Dalston Junction station, took place at an OPEN public event on 16.9.10. The event was packed with Dalston residents for an evening which included literature, poetry, music, local news and satire. The politico-cultural soiree was delivered, almost without exception, by performers from our local creative community who live within walking distance of the venue. If you missed the OPEN event at St Barnabas Church then here is your chance to listen to podcasts of what took place ( go to the OPEN podcast site here). David Garrard of English Heritage told us how the Grade II* listed St Barnabas church ("the building I should like to be remembered by") was designed by the architect, Charles Herbert Reilly. And how the pre-modernist 1911 brick and concrete Byzantine basilica had been softened by a core of vivid colour and decoration, much of it provided by the Liverpool sculptor Tyson Smith. On the night of the event the church had been lit to stunning effect using Arcola's carbon free hydrogen lighting, which created an atmosphere of intimacy and enchantment. 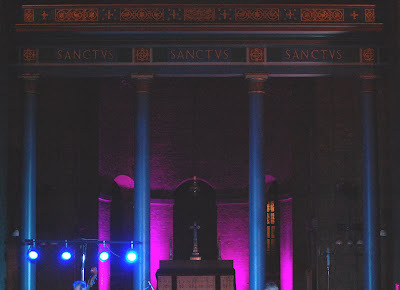 Event lighting and photos courtesy of Arcola's David Salter. Also from Arcola Theatre its producer and playwright Leyla Nazli, and Arcola Energy's Dr Ben Todd, told us of the 10 year history of building Arcola's national reputation in Dalston and its public appeal for £150K to help their current move to the Colourworks in Ashwin Street, Dalston. During the evening we had two sets of music from local musicians The Dulce Tones. They were also joined by the next generation, two local youngsters, for a rendition of The Pink Panther. Then there was the presentation of the Ceausescue Golden Spoon Award to Mayors Jules Pipe and Boris Johnson (regretably in their absence) by Steve Butters of Capacities Ltd. Winning the most public votes for the least popular development, the Golden Spoon award recognises the overbearing presence of the authorities' bulldozed scheme, Dalston Square. Lord Low of Dalston, OPEN's Patron and local resident, also spoke briefly on behalf of OPEN Dalston members who were presented with a certificate in tribute to their inspirational campaign and vigorous opposition to historic Dalston's obliteration and aspects of its redevelopment (hear their speeches on the OPEN podcast here). Another highlight of the event was Michael Rosen, broadcaster, poet and former national Children's Laureate, who performed "Regeneration Blues" accompanied by improvised music from The Dulce Tones. You can hear the performance on the OPEN podcast here. It will be broadcast by the BBC later this month. Look out for more poetry and jazz events in Dalston in the future. And finally, to round off the evening, the only bus stop which will be used on The Slab at New Dalston's £63million Transport Interchange, was sold by public auction. Local people heard how the cost of The Slab, to build The Bus Stop on, had risen from £26million to £39 million and is now estimated to cost £63million. But there was little enthusiasm for the project amongst the auction bidders. The bus-stop was snapped up, for just £7.50, by a Clapton resident who happened to be walking home past the auction venue in Dalston. He heard the auctioneer, Michael Rosen, describe how the 488 route is to be extended from Clapton to Dalston Junction. The 488 is the only bus which will use the new £63million Transport Interchange which has been built on The Slab above the station. "It'll be really handy for getting the train to Croydon" said the purchaser from Clapton, who preferred to remain anonymous, "but I do agree that a £63million Transport Interchange seems a lot for the public to pay just for my convenience". An OPEN public event will take place on Thursday 16 September beginning at 7.30pm in the evening. It will feature music, literature, history, satire and local news. 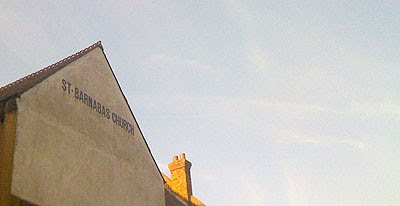 It will take place in Dalston at the St Barnabas Church and Hall, Shacklewell Row E8. Although partly in a church, the event is not religious and is open to people of all beliefs and none. The church is Grade II* listed built in 1910 in the Romanesque style. A secret gem of a building and only now being brought back into full use . David Garrard, from English Heritage, will give a short talk about the building and its history. The writer, poet and film-maker Iain Sinclair will read from his new, yet to be published, book and may range freely across issues of local and national interest. Michael Rosen, poet and broadcaster, will perform Regeneration Blues and other work - accompanied by The DulceTones ( Dalston musicians, including some of international repute and local notoriety). OPEN’s Patron, Lord Low of Dalston and Lady Jill also hope to attend the event. The building will be lit by Arcola Theatre - using a low carbon portable fuel cell - an invention of one of its Directors, Dr Ben Todd. 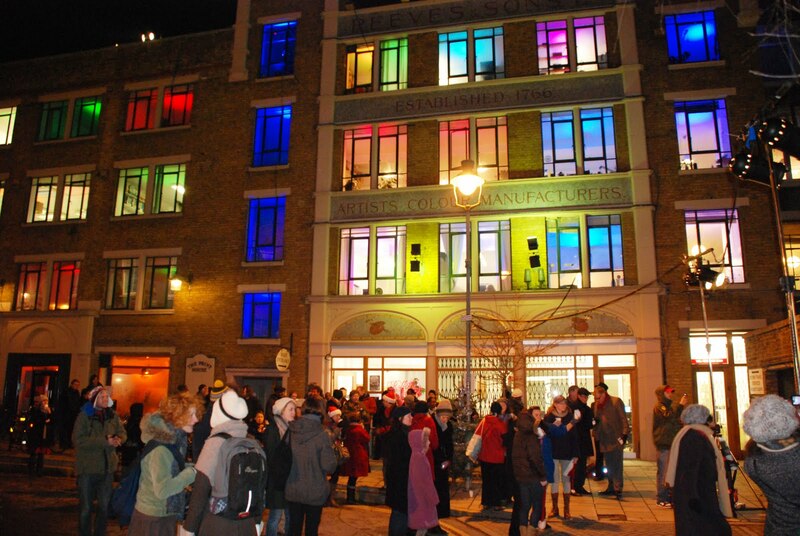 Arcola will also present plans for their forthcoming move to The Colourworks in Ashwin Street, Dalston, and plans for an new carbon-neutral theatre in Dalston. Another highlight of the evening will be to hear Steve Butters describe the fierce competition to win the Ceausescu Golden Spoon Award which has been won by the Dalston Square development - a public/private partnership scheme between Hackney Council, the Greater London Authority and volume house-builder Barratt. Phase2 of Dalston Square is now being built on The Slab. 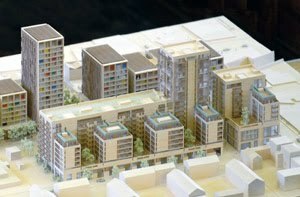 This architect's model shows Dalston Square completed.Phase 2 of the development at Dalston Junction is now under construction by Barratt and, like Phase 1, is being marketed for off-plan sales in the Far East. The main cheerleaders, and financiers, of the Dalston Square scheme were the Mayor of Hackney, Jules Pipe, and the ex-Mayor of the Greater London Authority, Ken Livingstone, who has since been replaced by Boris Johnson. Boris Johnson and Jules Pipe have both been invited to receive the award (although the presentation may have to proceed in their absence). The authorities argued that The Slab was necessary to build a bus/rail Transport Interchange above the station - but now TfL say that only one bus will in fact use it. The cost of the Slab has risen from £18m to £26m to £39m and is now estimated to cost £63 million. Following the presentation Michael Rosen will hold a public auction of Dalston's £63million Bus Stop. An artist's impression of Phase 2 of Dalston Square - 330 private flats and national brand stores. What the authorities' consultants, Drivers Jonas, described as a necessarily "high revenue generating scheme" to pay for The Slab. Throughout the evening there will be opportunities for discussion, heckling and other forms of dissent. The event is a fundraiser and there will be a £5.00 admission charge, £2.00 for unemployed, OAPs & students showing ID.